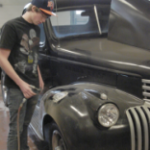 The Auto Body course provides the student a thorough understanding of how the vehicle is constructed, the tools of the trade and their safe use, and the materials that will produce a quality repair job. 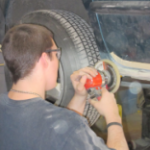 In the classroom, students will first study how to repair or replace damaged sections of an auto body and then immediately apply the concept to a related project in the auto body shop.Students may also obtain part-time related employment through a cooperative education agreement. 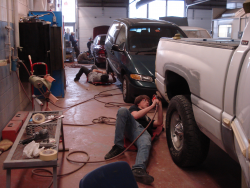 The scope of the program allows students to study at a college preparatory level as well as provide employment skills training. To request repair work on your vehicle, click here to submit a request form.